I’ve been toying with my dropbar Bianchi mtb for the past six months or more, but there always seems to be something more that I could tweak. I might be able to go with a road STI and an mtb front derailleur if I use a new Jtek front derailleur adapter that magnifies the front shifter’s cable pull. I only recently discovered that Jtek made a Shiftmate to adapt road shifters to mtb front derailleurs. Due to the difference in cable pull between the two types of shifters, the adapter is awkwardly large. Alternately, I could use a left Campagnolo Ergo shifter. The Campagnolo Ergo (not the newer “Escape”-type) pulls enough cable with enough index points as to acceptably shift a mtb front derailleur over the range of a mtb triple crank. This would have the bizarre set-up of a left Ergo/right STI on the handlebar. Another solution altogether would be to switch to a 2×9 system. A good 2×9 crank is more than just a mtb crank with the granny ring removed. It should take advantage of the granny ring’s absence to pull the remaining chainrings in closer to the centerline of the bike, allowing a smoother chain run from the cassette. To compensate for the loss of the 22t granny, the smaller remaining ring is typically 29t, just a little smaller than the triple crank’s middle 32tooth. A tighter pedal stance (sometimes called “Q-factor”) might also be desirable (particularly for your 5’3” author). But in the context of the dropbar mtb, the 2×9 crank means less travel for the front derailleur. With less cage travel necessary, the cable pull of a road triple STI is sufficient to position a mtb front derailleur across the 2×9 crank (for more details on front derailleur/shifter issues, see Dropbar MTB Pts 1 and 2). I am going toward the 2×9 system. My previous (flatbar) mtb had that set-up, and I felt that it had all the gearing that I needed for offroad riding. The one issue that I always had was that the Rapid-fire shifter didn’t have a trim position across the two rings; in the last set-up I had a SRAM Gripshift on the left-side just because I could trim the front derailleur. Strangely, the road STI triple might be more successful since the road STI’s shorter cable pull might create a useful trim position in the 2×9 system with an mtb front derailleur. I set-up a road bike as test mule, and though the results were promising, I won’t know for sure until I can actually take an mtb off road and shift while bouncing across ruts. If I chose the 2×9 set-up, I’d clearly have to run a 9sp cassette, owing to the lack of 11-34 ten speed cassettes. As mentioned before, I could try a 2×9 system with a Jtek adapter for the 10sp STI, but I have been a little wary of using the Jtek adapters since they can be tricky to set-up. A Jtek Shiftmate consists of a small pulley inside a bracket with 2 cable grooves of differing radii, with about 120 degrees between the exit and entrance of the bracket. Cable from the shifter enters the bracket at the front and winds first on the pulley’s small radius groove and then exits on the large radius groove, the net result is that the shifter’s cable pull is magnified from small 10sp increments to the coarser 9sp jumps. The Shiftmate bracket is typically situated between the last section of derailleur housing, looped off the chainstay, and the rear derailleur itself. The system is very sensitive to the length and curvature of the housing loop, and one must be careful to account for how the derailleur’s movement can pull the cable entrance through an arc, further complicating set-up. Shifting accuracy can also be affected by bumping the loop. My bike shop has probably equipped 30 bikes with this set-up, but I haven’t always been enthusiastic about the performance of each bike’s shifting. I often wonder how well those systems maintain their accuracy in dirty, real world conditions. Two recent developments have motivated me to revisit the Shiftmate option. One is the “Shadow” style of rear derailleur that Shimano offers as an option in all their mtb groups. The Shadow derailleur has a forward facing cable entrance, which eliminates most of the housing loop, in a way similar to SRAM mtb rear derailleurs. On a Shadow derailleur, the upper knuckle of the parallelogram, which holds the cable entrance, stays stationary as the lower portion articulates. Thus the curvature of the housing from the frame never changes. The icing on the cake is the Shadow’s lighter weight, improved cornering clearance, and higher return spring rate. The second development is the “inline” bracket that Jtek uses in Shiftmate adapters for mating Shimano shifters to SRAM mtb rear derailleurs. The inline Shiftmate bracket has entrance and exit ports at 180 degrees and is meant to sit in the middle of the housing between the chainstay and rear derailleur. By special order, Jtek will send you a Shiftmate with a #2 pulley (Shimano 10sp to 9sp) in an straight inline (“S”) bracket. By combing an #2S with a Shadow derailleur, I can eliminate most of the sources of the shifting inconsistencies. 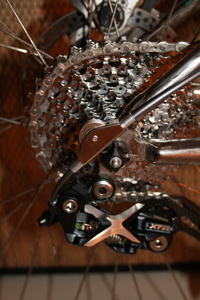 After work I installed the #2S Shiftmate with an XTR M972 Shadow derailleur and an XT M770 12-34 cassette. On the ride home from the bike shop, it worked quite well. It turns out that having the rear derailleur cable exit the frame from the seatstay makes for a more favorable position for the Shiftmate. Notice how in the picture above the bracket and pulley just clear the quick release nut. I might have been really unhappy if my bike didn’t have top routing for all the cables. The next step is the left-side Dura Ace STI and 2×9 crank. More pictures and performance reviews to come later.